It’s so beautiful, I’m not wearing a jacket! We’re going on a scavenger hunt outside! Did you see that amazing rainbow? I also took an informal survey about the time change, and 100 percent of our clinic families agree that it stinks. But we are enjoying the beauty of spring flowers blooming, longer daylight hours and more opportunities to get the kids outside to play! We’re running with the springy theme for our March craft, making pinwheel flowers, with fun patterned paper that is printed on both sides (including rainbows, ice cream bars, flowers, butterflies, and more). Craft Maven Carla says the hardest part might be picking out the paper. 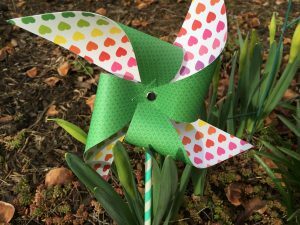 These pinwheels just beg to be taken outside to spin in the breeze! Last year, we had a blast wearing lots of crazy socks on March 21 for World Down Syndrome Day. We invite you to join us this year! 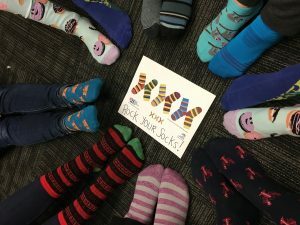 One of our clinic families shared this amazingly sweet video invitation to wear crazy socks. See if you can resist digging out your craziest socks once you watch! For our spring break week camp, Jenny and campers (ages 6-14) will be running a Lemonade Stand, selling lemonade and other tasty treats to clinic families and other offices in our building. Camp participants will make recipes, work as a team, sell items, and have fun, all while working on speech and language skills, and social thinking. On the last day, campers will plan and throw a party using the funds they made from their sales. Kids can attend from one to five days of this afternoon camp (March 25-29, from 1-4 pm daily). Let us know what works with your schedule. Spaces are limited! Lori and Christina are starting a social skills group that meets every other week on Tuesdays at 5:15 pm (starting March 19). There will be a total of 6 sessions over 12 weeks, and this group is open to kids ages 8-12. This group will focus: on social/pragmatic skills; executive functioning (organization, planning, time management, and include cooperative projects); social problem solving; and self-monitoring/self-regulation. Let’s celebrate spring every day!